A thin, lightweight half rope for ultralight mountaineering, the Edelrid Skimmer 7.1mm Pro dry rope is ideal for glacier travel, technical scrambles, belays and short rappels on technical terrain. The Edelrid 9.8mm Boa DuoTec Dynamic Rope is the DuoTec variant of the tried and trusted Boa, With a permanent marking in the middle of the rope and a distinctive design. 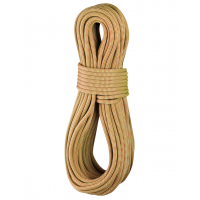 The Edelrid 9.8 mm Boa Dynamic Rope is a lightweight sport climbing rope. Its Thermo Shield treatment and relatively narrow diameter make it suitable for a wide range of activities. The Bulletproof - Bent from Edelrid is an innovative, robust hybrid biner with steel insert at the apex of the biner. Prevents premature wear and burrs on sharp edges. Keylock closure. The Bulletproof QD Set from Edelrid is a robust sport climbing quickdraw outfitted with a Bulletproof - Straight and a Bulletproof - Bent carabiner made with a steel insert in the lower biner to prevent premature wear. The Edelrid Cosmic Twist Chalk Bag holds your chalk in a 100% spill-proof secure bag so you can get to getting without fear of losing your chalk. Built with a waist belt and brush holder for easy access. The Edelrid Boa Eco is a robust, all-round rope that's made of high-quality yarns left over from production, giving it a unique look but the same handling and strength as other Edelrid ropes. Edelrid's Boa Eco climbing rope is made from leftover yarns from the production of other ropes, then treated with Edelrid's ThermoShield for smooth running. Bluesign approved, and please note that every rope is unique in its look and color. 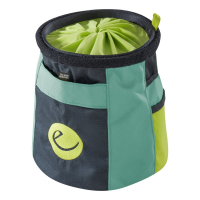 Edelrid's Boulder Bag II is a big chalk bag for open projects with a broad, stable base and dust-proof closure. Main photo is Jade.